I just purchased an electric fireplace for my bedroom. I got it on sale, plus with another discount and a rebate. 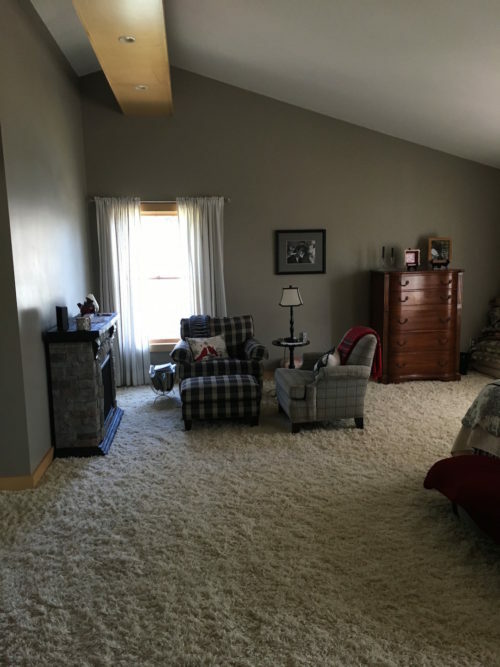 I’m trying to decide how to arrange my bedroom chairs around it. Would you like to help me? 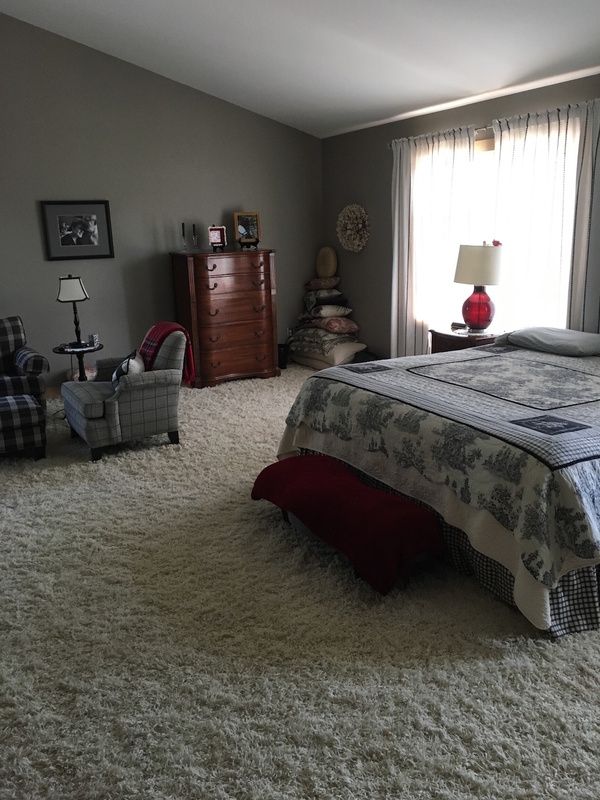 Below is a picture of part of my bedroom, which is pretty good-sized. The windows behind the bed face Lake Superior, so I am blessed to be able to look out and see that breathtaking, vast body of water every single day. You can click these photos to enlarge them if you like. I put the fireplace on a blank wall. It has a fairly real looking flame with glowing embers and logs, and it will keep this room warm. It can also be used for just the flame with no heat. I love sitting in my bedroom chair (the biggest one with the darkest plaid fabric) to read, do my Bible study, write in my gratitude journal, and to have tea with friends. 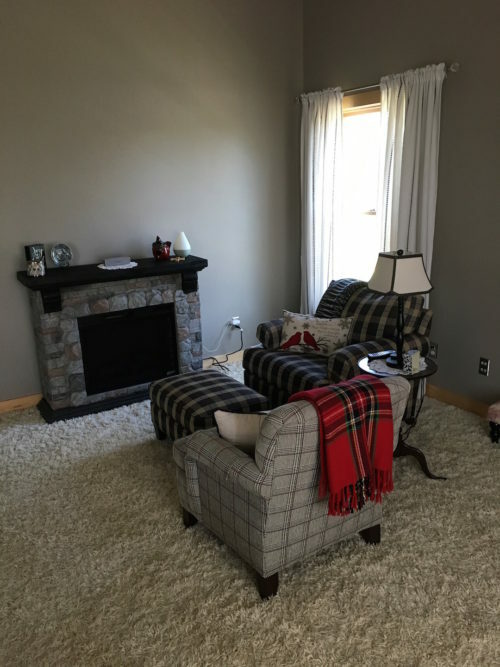 Option #1: Below you can see the two chairs arranged in an L shape, close to the fireplace. 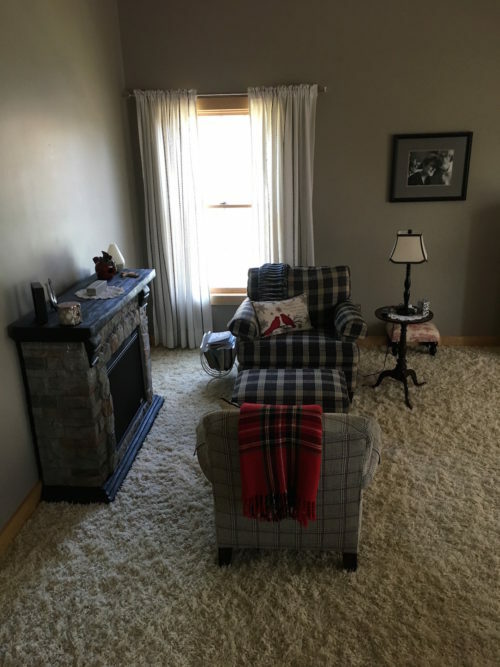 Another view of option #1: I like this arrangement because I can enjoy the fireplace, have some natural light behind me for reading, and can still look to my left and see Lake Superior through the windows. 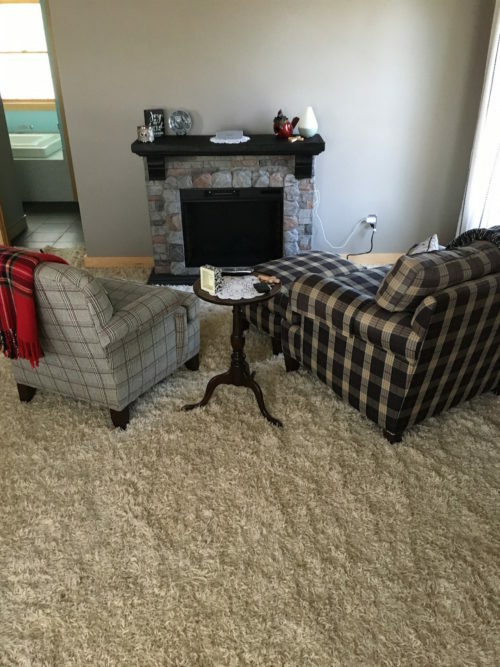 Option #2: The chairs are facing each other near the fireplace, sharing the ottoman. I have some friends named John and Barb who have their chairs placed this way, and they have their coffee and morning devotions together like this. They like the face-to-face interaction this arrangement gives them, and I like that idea a lot too. Option #2: Another view of the chairs facing each other. 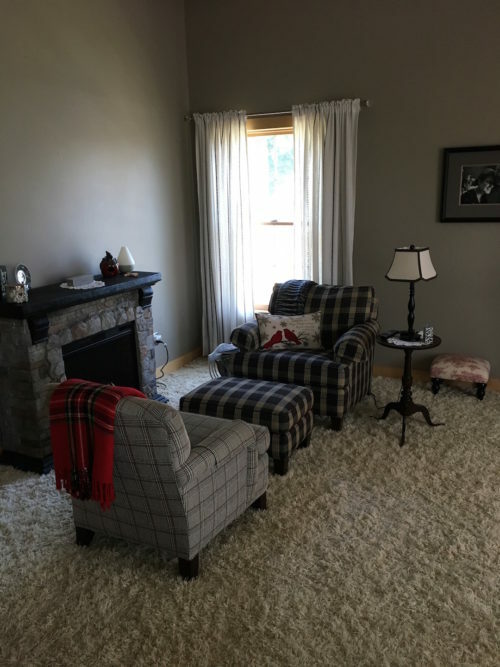 Option #3: I arranged the chairs at an angle, both facing the fireplace. I had to put the little lamp that was on the round table somewhere else, since with this setting there’s no close outlet for the lamp. I also haven’t styled the mantel yet — I will be thinking about how to dress the space in the future. 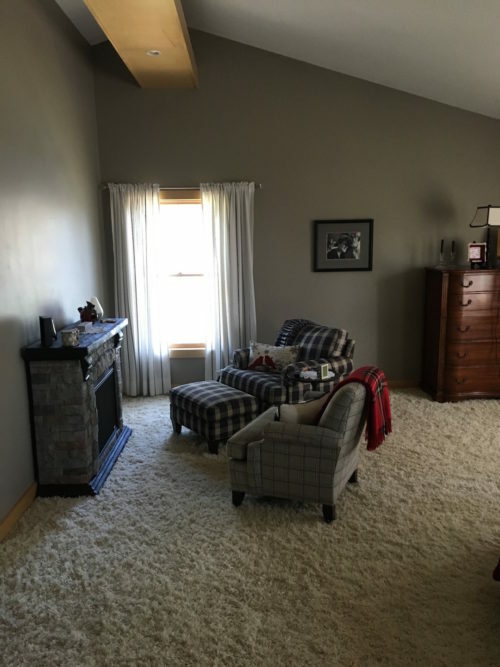 I need something large on the wall behind the fireplace too. And if I choose this arrangement I need to center it on the wall. Option #3: Another view of the chairs angled toward the fireplace. I think this is homey feeling, but miss having my chair situated so I can see Lake Superior at the same time. As you can see, there are advantages to all three chair placements. Would you mind casting your vote in the comments? Let me know if you like #1, #2 or #3 better. Or maybe you have an even different idea — I’d love to know what you think.